Are You an Artist Who Want to Perform at the Club? Please send an email to mark@jazzforumarts.org and we will get back to you shortly. Please provide the following information in your email: Name of group, short bio, links to audio, video and/or EPK. 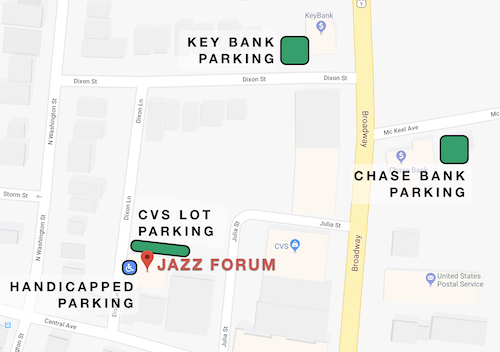 The Key Bank parking lot on Dixon Street, west of Broadway. The Chase Bank employee parking lot on McKeel Avenue, east of Broadway. The CVS parking lot adjacent to the club, west of Broadway (limit 20 spaces facing the club or next to the two large Budget rental trucks). Two handicapped parking spaces (with sticker) in Jazz Forum driveway, next to club entrance.